The CAF has been in Minnesota since 1971 when the Minnesota Wing was formed in 1971. The Minnesota Wing was the very first charter unit of the national headquarters wing of the Commemorative Air Force and operated as a maintenance support arm to help the CAF’s mission and its ever growing fleet of rare aircraft. The Minnesota Wing, Commemorative Air Force, St. Paul, had a WWII PBY Catalina amphibious aircraft. Disaster struck in 1998 when a wind storm flipped it over, basically destroying it. The group purchased a similar replacement (Bureau 64092) and their insurance company demanded the aircraft be stored in a hangar. Since the Minnesota Wing’s hangar was to small the only other facility large enough to house the PBY with its 104-foot wingspan was an abandoned hangar in Duluth. This PBY had been among other things a search & rescue aircraft, a general cargo carrier, and finally a fire bomber and in this configuration flew for several years but significant fuselage corrosion eventually grounded her as well in 2002. Once it was determined that this PBY would never fly again, the Lake Superior Detachment then inquired about PBY-6A Bureau No. 64097 which had been flipped on her back during a heavy storm and was it available. In 200x the Commemorative Air Force chartered Lake Superior Squadron 101 as a free-standing organization with the CAF, separating it from the Minnesota Wing. Today, the Squadron is doing something radical, and probably never before attempted outside of the military. They are rebuilding the damaged, but relatively corrosion-free fuselage of Bureau 64097 (known as the Blue Plane) and replacing the crumpled wing with that from their other former fire bomber, Bureau No. 64092 (known locally as the Red Plane) . In addition the engines from the other PBY have been mounted on the existing blue fuselage which along with the red wing and motors marry the two aircraft together. It is a massive undertaking, but the team has made remarkable progress since the project began in 2009. They have already grafted the two aircraft together and are well on the way to forming one airworthy airframe. Since the fuselage came from Bureau No. 64097, that will be the identity of the aircraft once the restoration is complete. The PBY Catalina played a crucial role in World War II, both in long-range reconnaissance and U-boat suppression, not to mention air sea rescue missions and other vital activities. 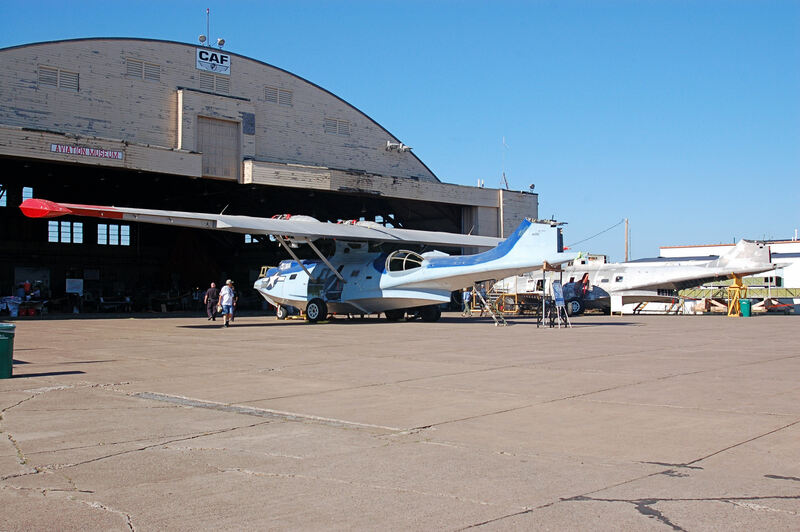 The CAF Lake Superior Squadron, based in Duluth, Minnesota, is currently hard at work restoring a PBY back to flying condition.